Our former postdoc Joseph Pollock has transitioned into a job as the Director of Coral Strategy for the Caribbean Division of The Nature Conservancy. This entry was posted in News on November 14, 2017 by Ana María González Angel. We presented at the TREE seminar! 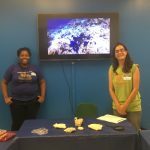 This past weekend Aki, Viridiana, Ana, Gabrielle and Monica visited the Three Rivers Evolution Event that was hosted by the University of Pittsburgh. This entry was posted in News on September 13, 2017 by Ana María González Angel. The Penn State Postdoctoral Society has awarded our current postdoc, Joe Pollock, the 2017 Outstanding Postdoc Award. Joe will receive this award in at the 10th Annual Postdoc Research Exhibition on Friday, September 22, 2017. This entry was posted in News on June 21, 2017 by Ana María González Angel. We welcome our first Bridge students! This summer the Iglesias-Prieto, Baums, and Medina Labs from Penn State will be hosting 3 students from USVI through our Bridge to PhD program. Collin, Kathryn, and Akacia will be learning from each lab’s area of expertise in an intensive 8 week period. We hope this program motivates them into continuing their education with a PhD, and perhaps joining us here at Penn State! 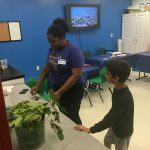 This entry was posted in News on May 25, 2017 by Ana María González Angel. Mónica just published a note in Nature that accompanies the recently Acanthaster planci genome paper. Check it out! This entry was posted in News on April 5, 2017 by Ana María González Angel. We are happy to announce that the First International Cassiopea Workshop will be held on May 13-17 2017 in Key Largo Florida. This will be an opportunity to engage in collaborative work and ideas using our favourite jellyfish, Cassiopea, as a model system. We are hoping you can attend! Details are available on the link above and please do not hesitate contacting us. This entry was posted in News on March 27, 2017 by Ana María González Angel. We are currently working on a very special reef in Cartagena, Colombia known as “Varadero reef”. This reef is special due to its amazing coral cover despite the environmental conditions around it for the past few hundred years. Unfortunately, this reef is within the optimal route of a new canal dredging project and may be lost. We are working in collaboration with the Vega Thurber Lab in Oregon State University, and local Colombian scientists from academia and NGOs to learn more about this reef. 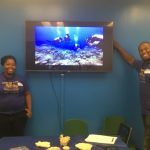 Our partners in OSU have recently released a short documentary about this reef that we recommend. We are calling this, The Heroic Reef. Estamos trabajando en un arrecife de coral muy especial en Cartagena, Colombia cuyo nombre es “Varadero”. Este arrecife es especial dada su magnífica cobertura coralina a pesar de las condiciones ambientales que sufrido desde hace ya varios siglos. Desafortunadamente, este arrecife está ubicado en medio de la ruta óptima planeada para la expansión del Canal del Dique y tememos perderlo en la construcción. Asi que estamos trabajando en colaboración con el laboratorio Vega Thurber de la Universidad del Estado de Oregon (OSU), científicos colombianos y ONGs para aprender más acerca de este arrecife. Recientemente nuestros compañeros de OSU han publicado un documental y los invitamos a verlo con subtítulos en español aqui: El arrecife heroico. This entry was posted in News on February 9, 2017 by Ana María González Angel. The Global Coral Microbiome Project is featuring a new website. You can access it here to learn more about the project itself but also the team, the expeditions and more. Check it out!